1 Sprinkle the fish with a little lemon juice. Heat the oil and sweat the shallot and garlic until translucent. 2 Add the chilli to the shallots and sweat briefly. Stir in the tomato puree and sprinkle with 1 level tsp sugar. Stir in the strained tomatoes. Season to taste with salt and pepper, add 1 tbsp lemon juice and remove from the heat. 3 Dry the fish fillets, season lightly with salt and spread with the red sauce. 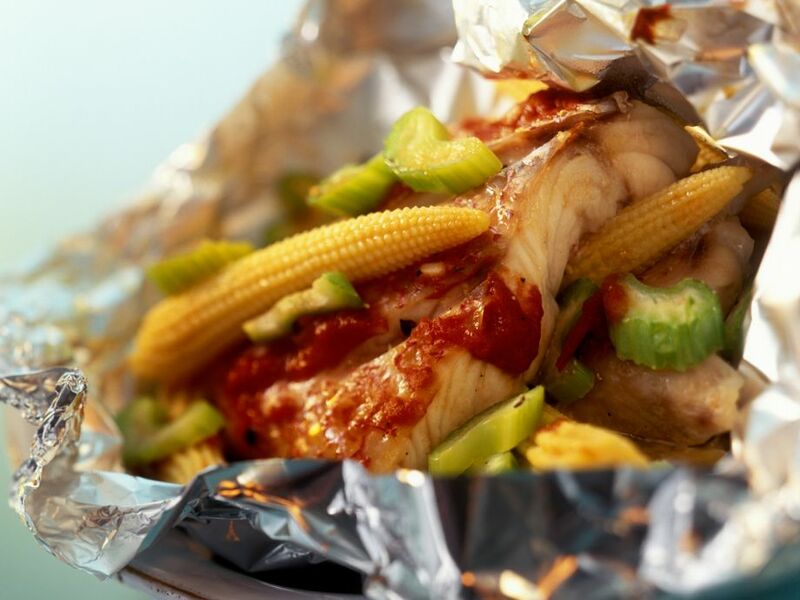 Place each fillet on a large piece of aluminium foil, add a few baby corn cobs and a little celery and seal the aluminium foil to make a parcel. 4 Bake in an oven preheated to 180°C (160° fan) | 350F | gas 4 for 25 minutes.